The rising tide of teacher activism continues today, as thousands of educators in both Arizona and Colorado walk out of their classrooms and head to their respective state capitol. Unfortunately, they could be playing into the hands of those who want to bust teacher unions and divert billions of dollars to a select group of private schools. In Arizona, 78 percent of the 57,000 school employees who cast ballots across the state voted to walk out. Around 30,000 to 50,000 teachers and their supporters are expected to march through Phoenix to rally at the Arizona state Capitol to demand a 20 percent raise for teachers, about $1 billion to return school funding to pre-Great Recession levels and increased pay for support staff, among other things. In Colorado, more than 10,000 teachers are expected to demonstrate in Denver as part of a burgeoning teacher uprising. About half of the student population will have shuttered schools as a result. The teacher walkouts are the climax of an uprising that began weeks ago with the grass-roots The Red for Ed movement that spread from West Virginia, Oklahoma and Kentucky. Colorado lawmakers from both parties have agreed to give schools their largest budget increase since the Great Recession. But teachers say that the state has a long way to go to make up for ground lost during the recession and strict tax and spending limits. Arizona teachers, on average, make $48,304, according to 2016-17 salary data from the National Education Association. In 2016-17, the national average teacher salary was $59,660. Arizona Gov. Doug Ducey said he’ll urge the state’s legislature to pass a combined 20 percent teacher pay raise by 2020, but educators aren’t buying it. The teachers’ union said that tomorrow’s march to the Capitol is necessary after attempts at outreach have been ignored. There’s no end date for the walkout and he said educators might have to consider a ballot initiative for education funding if lawmakers do not come up with a plan on their own. The statewide teacher walkouts in West Virginia and Oklahoma both lasted for nine days. Thomas said he thinks teachers in Arizona would be willing to stay out that long, too, if needed. One Republican state lawmaker has proposed a three-year, one-cent education sales tax increase, which would provide the state’s public district and charter schools with $880 million a year more in discretionary funding, according to the Arizona Republic. It remains to be seen if that proposal will generate enough support in the legislature to pass. Republican Governor Doug Ducey proposed a 20 percent raise for teachers by 2020, but organizers of the so-called #RedforEd movement say his plan relies on rosy revenue projections and doesn’t address the other issues. He’s running a statewide advertising campaign to position himself as a savior–not part of the statewide education crisis. As such, he’s positioning the teachers as the villains and demons. Colorado’s Governor Hickenlooper is considering legislation that will punish, if not fire, teachers who exercise their right to free speech and assembly. Let’s hope that the teachers aren’t shot and killed like the coal miners who went on strike in Colorado more than 100 years ago. Meanwhile, Arizona’s house majority whip, Kelly Towsend, announced on social media that she’s consulting with lawyers over a potential class-action lawsuit “for those who are impacted by the extended school year or other harm that comes to them by the teacher walkout.” She told the Arizona Republic that she’s worried the walkout will delay her son’s high school graduation, and her family members have already bought plane tickets for the event. Her comments were met with derision and anger from teachers and other citizens. In Colorado, many public schools have shifted to four-day school weeks to save money. Public schools are pushing Amendment 73 to help fill the funding gap that has crippled public schools. School districts continue to promote mill levy increases to help patch their schools back together. Privateers are fanning the flames and picking up up the pieces. Elected and appointed officials are helping dismantle public schools in many states. It’s big business. 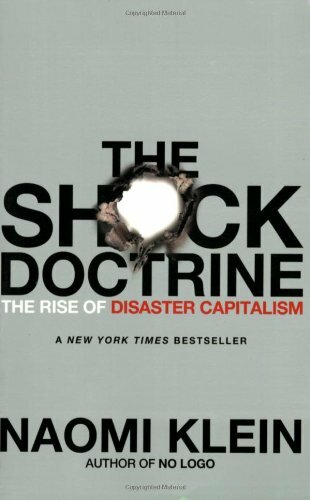 To fully understand the rush to mass privatization, please read the book, Shock Doctrine. The author puts this endless stream of crises and chaos in frightening focus. Now the privateers have declared war on public schools for profit. Those who will be hurt the most have been brainwashed into helping overthrow our public school systems. Ironically, the controversial common core curriculum that helped cripple America’s public schools is a product of Pearson Education (a British enterprise with questionable motives). They made billions breeding dissent and dysfunction. It’s clear that elected officials in most, if not all, states are fanning the flames of the education crisis and tilting the tables toward private schools. Billions of dollars are on the line in most states and companies are poised to make a killing from the rush to mass privatization. Competition within the public school system is one thing, but destroying them with corrupt policies and practices is another.